I'm a Canadian academic and musician living in Scotland. By day, I work as a researcher. By night, I play in a band. Okay, so I haven’t been doing very well with consistently posting to this website, but my New Year’s resolution is to do better. I’m back in my hometown of Fredericton for a couple of weeks, researching by day and watching movies by night. From my viewings, I can recommend two great documentaries called The Grizzly Man and Murderball. 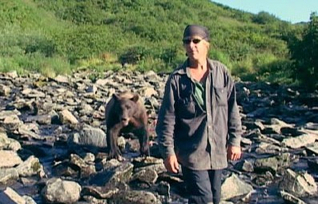 "Grizzly Man" is … a small masterpiece of a documentary that takes us into the heart of a complex darkness: the mysterious land of Alaska, the world of grizzly bears and, most significantly, the soul of Timothy Treadwell, a man who tried to break down the atavistic borders between man and beast, and failed. After spending 13 summers with his beloved grizzlies, Treadwell (along with his girlfriend, Amie Huguenard) was killed and devoured by a bear in October 2003 … Treadwell, who considered himself a wildlife activist, was many other things, too: a lothario; a surfer; a failed TV actor; a serial makeover man, who, at one point, reinvented himself to "be" Australian; and a recovering addict, who considered bears to be a sort of magnificent distraction from his destructive inner demons … The result is an extraordinarily moving portrait of a man, a sort of illiterate artist, untrained as a filmmaker but powered by his own conviction and personal vision … There is a powerful argument running through the movie, an ideological clash between Treadwell's environmental harmonizing and [director] Herzog's view of the universe as an eternal catastrophe of destruction and chaos … It's a portrait not only of a fascinating man but also of human nature in general. This is one of those rare docs, like "Hoop Dreams," where life provides a better ending than the filmmakers could have hoped for. Also like "Hoop Dreams," it's not really a sports film; it's a film that uses sport as a way to see into lives, hopes and fears. These tough all-Americans compete in international championships. Once they were shattered young men waking up in hospital beds and being told they would never walk again …[Murderball] works like many great documentaries to transcend its subject and consider the human condition. We may not be in chairs and may not be athletes, but we all have disabilities, sometimes of the spirit. To consider the bleak months and sleepless nights when these men first confronted the reality of their injuries, and now to see them in the full force of athletic exuberance, is to learn something valuable about the human will.